Bit of biofuels from the bush, poured into and powering one of those Flying Kangaroos, and you have the latest news out of Australia, and a beauty if you happen to barrack for aviation biofuels. The world’s first dedicated biofuel flight between the United States and Australia, QF96 from Los Angeles to Melbourne, has departed from LAX and arrives roughly at Digest press time. The trans-Pacific 15 hour flight will operate with approximately 24,000kg of blended biofuel, saving 18,000kg in carbon emissions. Qantas will use biofuel processed from Brassica Carinata, a non-food, industrial type of mustard seed, developed by Canadian-based agricultural-technology company, Agrisoma Biosciences (Agrisoma). Across its lifecycle, using Carinata-derived biofuel can reduce carbon emissions by eighty percent compared to traditional jet fuel. Agrisoma’s biojet fuel is made by harvesting tonnes of Carinata crop, crushing the grain to recover the oil and converting that oil into jet fuel using the same process to make petroleum-derived jet fuel. The biojet fuel that is made, provides for a very significant reduction in greenhouse gas emissions, making travel greener and cleaner for the environment. The oil is then sent to bio-refineries for conventional processing into jet fuel. AltAir, which converted the Carinata oil into jet fuel, operates the world’s first commercial-scale renewable jet fuel plant at the AltAir Paramount refinery in Paramount, Calif. The plant produces 35 million gallons per year of renewable fuels, including Honeywell Green Jet Fuel, using Honeywell’s UOP Renewable Jet Fuel process, which produces fuels that are chemically identical to petroleum-based fuels. Fuel for the flight was produced by AltAir Paramount LLC using Honeywell UOP’s Renewable Jet Fuel process technology, which converts non-edible animal fats and oils into renewable fuels. Delivery of the fuel to the aircraft is provided by supply partner World Fuel Services from Miami, Florida. Carinata requires no specialised production or processing techniques. It is water efficient and The University of Queensland field trials in Gatton, Queensland, and in Bordertown, South Australia, have demonstrated it should do very well in the Australian climate. It is sown in either fallow areas where food crops fail or in between regular crop cycles, known as “cover cropping”. Rotational or break-crops can improve soil quality, reduce erosion for food crops and provide farmers with additional income. 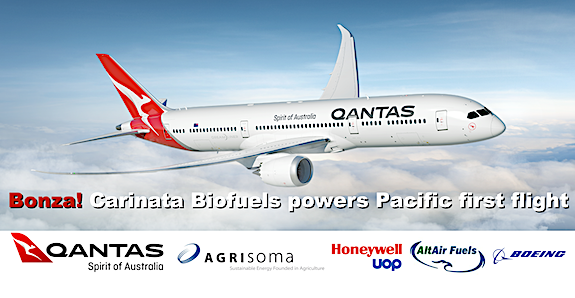 Qantas established a partnership with Agrisoma to promote Carinata as a crop for Australian farmers, specifically as a renewable feedstock for making commercial aviation biofuel. The first such commercial seed crop is expected to harvest in 2020. Also, the crushed Carinata seed produces a high-quality, high-protein, non-GMO meal for the Australian livestock, dairy and poultry market. One hectare of Carinata seed yields 2,000 litres of oil, which produces 400 litres of biofuel, 1,400 litres of renewable diesel and 10% renewable by-products. Qantas International CEO Alison Webster says it is fitting the airline’s new Dreamliner 787-9 will showcase the future of sustainable aviation. “This is the beginning of something big”, says Agrisoma CEO Steve Fabijanski. This 10% represents a pivotal shift in helping airlines like Qantas work toward a 100% carbon neutral growth starting in 2021,” says Fabijanski. Quebec’s Minister of Energy and Natural Resources and Minister Responsible for the Plan Nord, Pierre Moreau says the announcement clearly shows Quebec’s leadership in the fight against climate change. “The measures our Government is introducing to support innovative companies and the ingenuity of the Québec people are paving the way for new technological breakthroughs such as the one achieved by Agrisoma, which will revolutionize air transportation. I am especially proud to stand by their side today, as they formalize their partnership with Qantas Airways,” said Moreau. “AltAir is pleased to have refined Agrisoma’s promising new oil into sustainable jet fuel for Qantas’s historic trans-Pacific flight”, said AltAir President Bryan Sherbacow. Commercially linking these advanced technologies in an integrated supply chain is critical in demonstrating the industry’s current capability to deliver ultra-low carbon intensity fuels to commercial aviation at cost-competitive prices.